By the way, this image shows all the shades of elephant hide I have. In the small ring I used: bright white, light gray, dark gray, black. In the larger ring I used: white, chamois, light brown. For the backdrop: light gray. Ah, probably worth mentioning: at this size the elephant hide was quite thick. I made good use of my bone folder instead of ruining my finger nails. where are those creases made to make it 3d anyways? 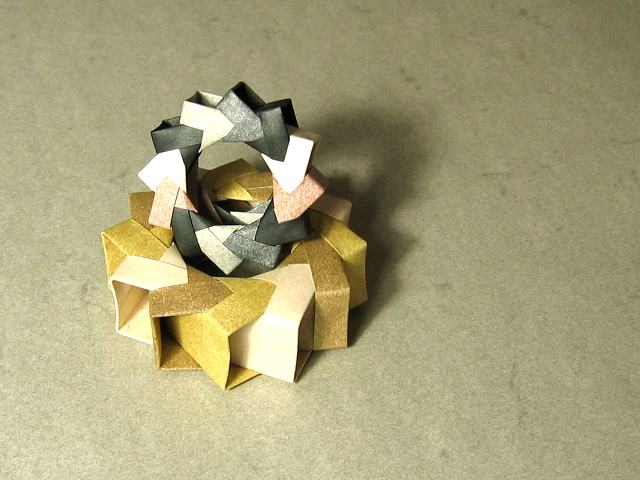 I think Michael LaFosse has that same design in his book "Origami Activities", called "Chinese Zodiac Wheel". Seems like several people have discovered the same 3D ring independently. He also has an 8-unit variation called "I Ching Wheel" in the same book. Simply define a reference for yourself and repeat that. I think I aligned a corner with an intersection of two layers of paper back when I folded this - but I also made it up on the spot.